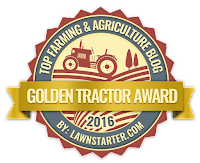 The 7MSN Ranch: Who's that sleeping in my bed? I fall more in love with these two every time you post photos. They are just the cutest things. I want one! That is just the funniest thing I have ever seen!!! 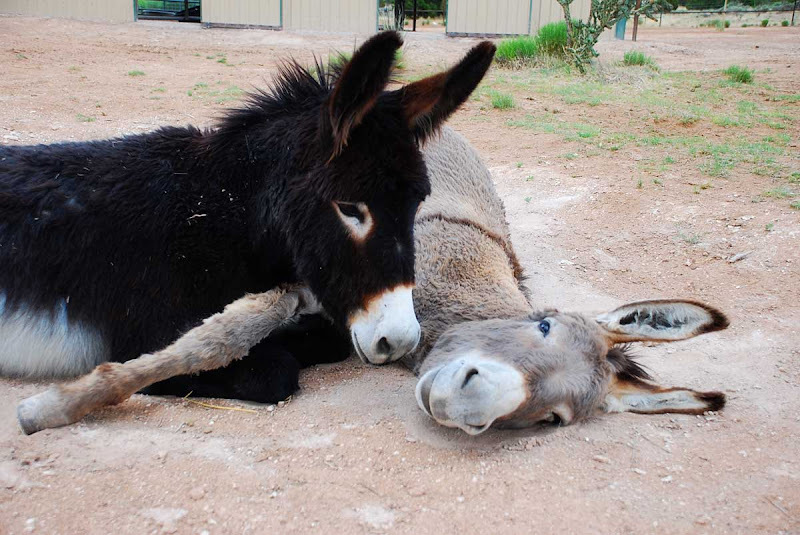 Do Alan and George sleep like that a lot? I love Deets giving his opinion on things too! Alan and George are so darling, thank you so much for your webpage, I enjoy it so much. Well sure, why put your head in the dirt when you can have a cushy pillow. Like the look on Deets little puss too. I love your blog. I check in often and I'm always amused. What a little snooze-fest you had going on there! I'm glad everyone was comfortable! Poor Deets...he needs a buddy to roll in the dirt with!! Cute photos. those have got to be the sweetest pictures of long ears I ever did see. You could produce bumper stickers with those pictures on them and the phrase, "Get off my *ss!" That has to be the cutest thing I have EVER seen! I think Deets wanted to get some cuddling too! Remind me to send them a Twister game this Xmas.... for sure. I'm with Colleen. The more I see of them, the more I want my own George & Alan. Critters. What do you do with them? This is pretty funny. I just love how the hee haws just lay all over each other! Just when I think those two couldn't be any cuter, they are ! Thank you for making my DAY !!!!!! no way!! these guys are so CUTE!!! OMG, how adorable is that! That tops anything they've ever done so far. I'm completely smitten. Damn. 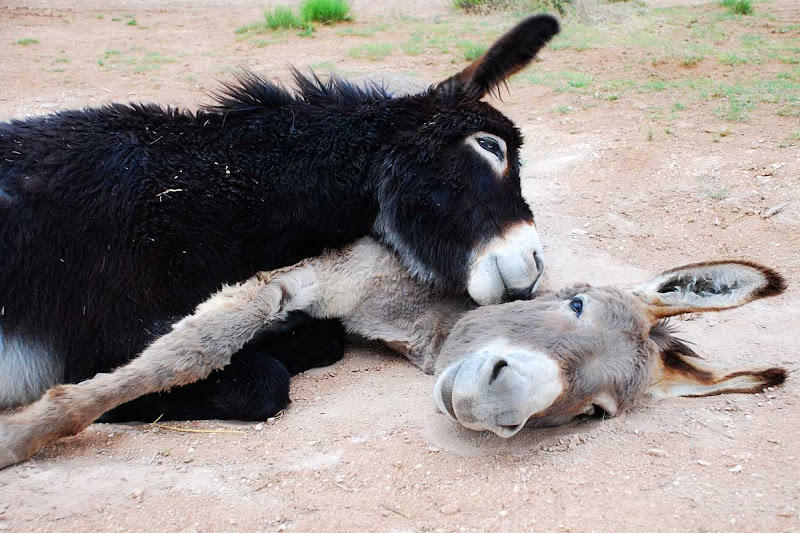 Now I'm going to have to add donkeys to my list of 'must have' animals. What is with your animals and their tongues? Love the one with Deets sticking his out. I never have a single day without George and Alan. From my first cup of coffee I look up and there they are, cavorting around on their calendar. I wonder what we'd get if we added up all the smiles you have brought to people every day? 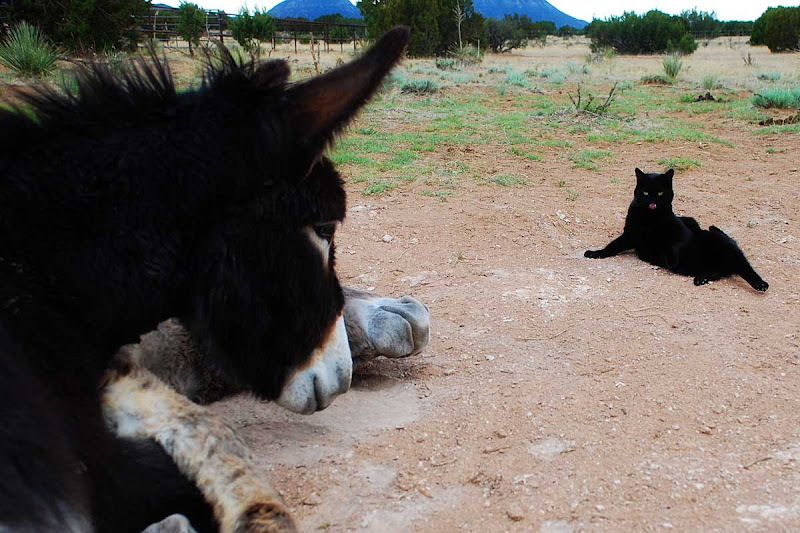 Linda...isn't it so very neat that donkeys don't have the fear of being eaten, like horses do? 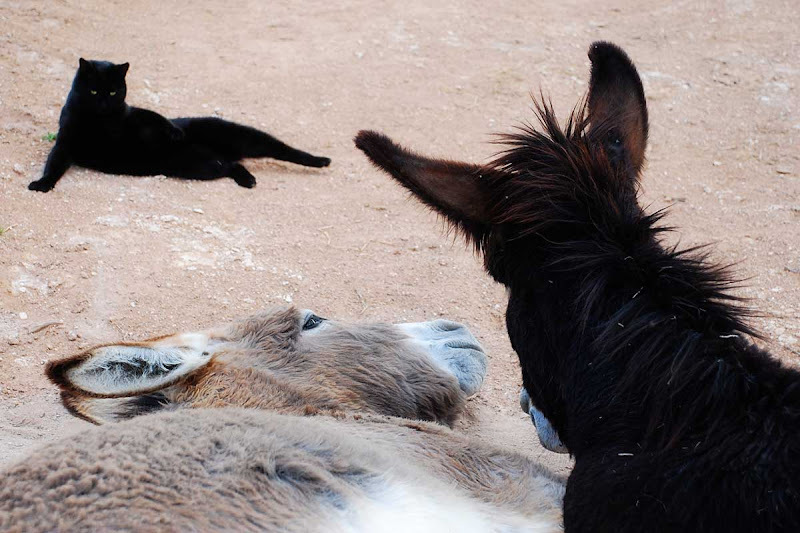 I am sure you are using a clever lens, but with donks you can just walk right up to them and take their picture. And get special ones like your last. A horse, or any horse I have owned, would be scrambling to his feet if I came too close with anything other than FOOD! Good job! This definitely makes my Top 5 Cutest Things Ever! list. :D Thanks for sharing. They are so stinkin' cute!!! 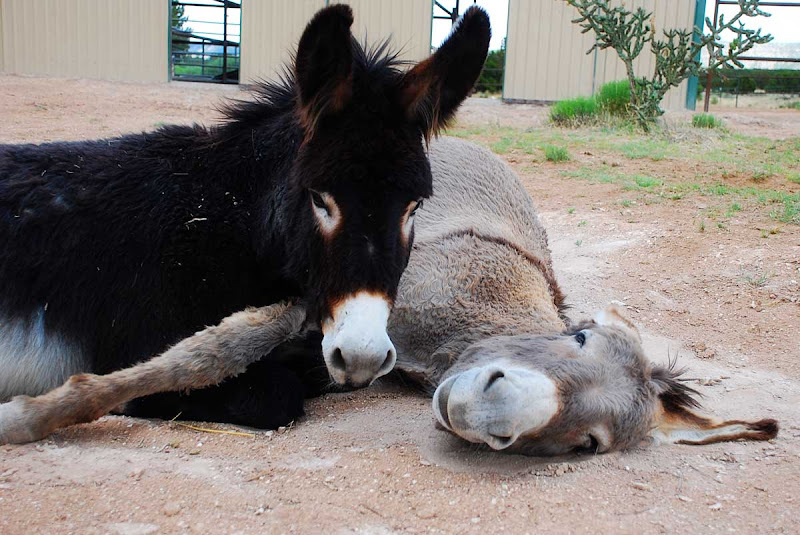 Who knew burros cuddled with each other? Ok, maybe you did, but I didn't, lol. Love the pictures!! 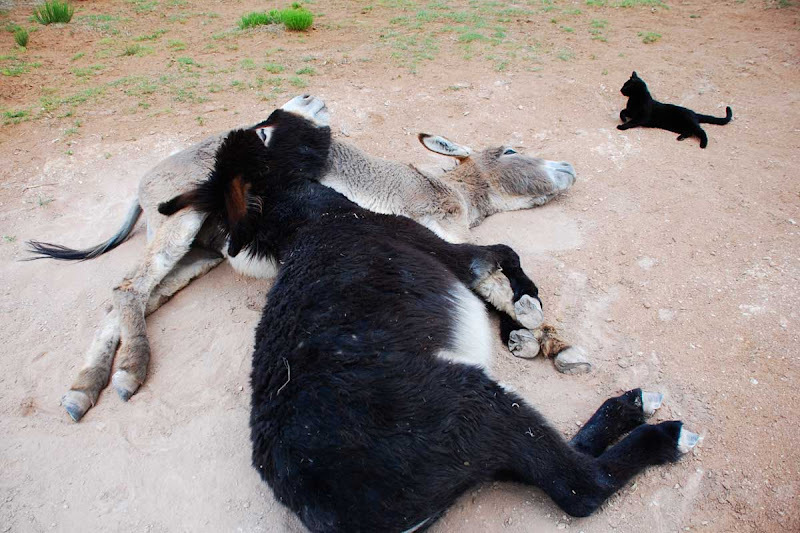 I have five donkeys and never see any cuddling like that. Best pictures I have seen in a long time! Thanks! They are just the cutest. They make me want to buy a huge piece of property and adopt a couple. those two just warm my heart. they've made my day. Alan and George looks adorable and friends! And Deets so cute too.